The story of DNS begins in the small country of Denmark in Northern Europe, where 100 young adults met on a farming property called Tvind on a fresh, windy autumn day in the far western part of Jutland. That day, they started on a four-year training programme to become teachers in Danish primary and secondary schools. They were the students and teachers of the first team of the Necessary Teacher Training College. It was September 1st, 1972. This was no ordinary college. The 10 teachers, who called themselves veterans, were not much older than the students. 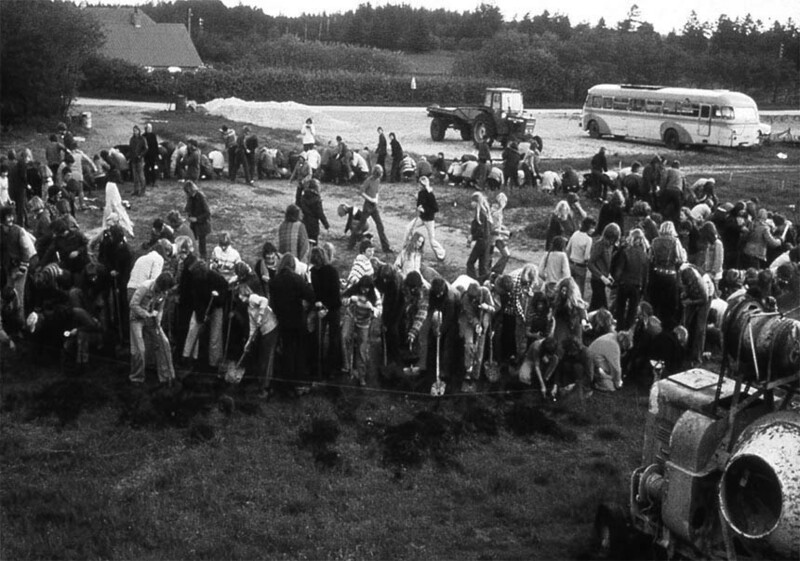 The buildings were not quite ready – that summer, the teachers and a group of the students had started building the college on a bare field, digging the foundations and making the water and sewage systems for the buildings, preparing to receive the prefabricated wooden buildings which by now, in September, stood in place on their foundations. Now, the last building tasks had to be finalised, so the first task for the arriving students was to roll up their sleeves and become part of the building team. From here, the team embarked on the first period of the programme. It was a two-month period in which students and teachers prepared themselves for a four-month travel in busses across Europe and Asia and back. During the period, they completed the buildings; they bought, repaired and furnished 10 old busses for the travel across Asia; they read books and articles about the travel countries and about international relations and big issues of their time, and discussed what they learned; and they started pondering and discussing what children learned in schools, and how school and children and the world at large were connected. What was necessary for them, the student teachers, to learn and train to become good teachers? From the start, all decisions were taken by the Common Meeting. Students and teachers planned and carried through the programme together and ran the school together with all practical and organisational tasks, from cleaning, managing the economy to preparing food and fixing the water pipes, and students and teachers planned the travel route and all the studies together. In the beginning of November, all was ready, and 10 busses departed from Tvind and embarked on their journey. Lumbering through the landscapes at 50 km per hour, the DNS students and teachers stopped the bus and spread out for investigations. They lived and worked and talked with all kinds of people, met the very poor and the very rich, and experienced for themselves the many contradictions of the world, far away from the relatively rich and protected Danish society, and yet connected to it in so many ways. These first students and teachers at DNS were at the beginning of a teacher training programme never seen before. Its idea, programme and pedagogical principles were ground breaking and completely unlike traditional schooling. The DNS teacher training programme with its idea, content, elements, structure and organisation was created and started by the Teacher Group, a collective group of visionary people who since 1970 have worked with the training of children and adults, creating new school forms and constituting ways in which human beings can organise and stick together to influence and improve the world and better the human condition. The Teacher Group started their first school in Denmark in 1970. It was called DRH, which is a Danish abbreviation for “The Traveling Folk High School”. It was started by people with much knowledge about the world and its people and with experience in and ideas about innovative pedagogy. The Traveling Folk High Schools, were, and still are, schools for adults with the main aim of learning about the world in many ways – not least by traveling in it – and training in acting and organising oneself to contribute with relevant changes in society where they are sorely needed. Why was the college called “necessary”? The Necessary Teacher Training College was started from a necessity to train another kind of teachers to bring more relevant knowledge, mobilisation and life to children and schools, and through the teacher training programme to provide the teachers with the necessary foundations, abilities and skills they needed to live up to the demands and challenges of their profession. At the time, more and more well-meaning primary and secondary school teachers in Denmark had difficulties in living up to the demands of their job. Some gave up. While they were teaching the same stuff that they themselves had learned in school, using the same traditional methods, conditions in society were changing, not only within production and economy, but also socially and culturally, with big and pressing issues and contradictions, such as the growing inequality between rich and poor, which were not on the agenda of schools and teaching. At the same time, the children, and especially the youth, did not behave as the older generations expected them to. They questioned, and rebelled against, the values of the adult world, and did not behave with due respect towards their teachers and elders. A discipline crisis in schools was looming. The schools with their teachers were static institutions, trying to cling to truths and values of the past while the world outside was changing at a pace never seen before, and children and youth, as well as their teachers, were caught in the middle. A new teacher training programme was needed, one that would equip teachers with the knowledge and skills needed to live up to the demands of teaching children and youth in a rapidly changing and ever more globalised world; teachers who could connect with children and their parents because of own experiences from real life, and who were occupied with contents and methods of teaching that were relevant to the children, letting them train the knowledge and skills they needed to be able, as the new generations, to take on the challenges of the future and utilise their potential and possibilities. This was an absolute necessity. That’s how The Necessary Teacher Training College got its name. It was a political statement then, in 1972, and it still is today. 9 months training in experiencing and understanding the global reality. Followed by 3 months productive work and saving exercise. 9 months training in experiencing the national reality. Training cooperation with parents and within a group of teachers. Training to be part of functioning as a group in a smaller entity of society – for instance a smaller town. 3 months training in doing what you find it most appropriate to do. 2 years training in experiencing and understanding the reality of children and teachers in school situations, combined with theoretical studies of pedagogy, psychology and related subject areas.Training in cooperation between children, parents and teacher. Training in being a group of teachers in a community unit – e.g. a small town. Training in pedagogical and psychological critique of pedagogy and psychology. Training in crafting and setting up educational models based on own experiences. 1 year working in Primary School. When possible, several teachers together in one school – preferably in a group in the same community unit. Below, you can read a selection of quotes, explaining the background and ideas behind the periods of the DNS programme, from the application for the approval of the Necessary Teacher Training College in Denmark which was sent to the Danish Ministry of Education in 1972, and which became known as “The White Book”. “In a time that everyone considers characterised by fatal decisions that may hit the whole globe across all borders up till now, it is like carved into people’s minds that knowing and understanding international relations must be intensified and deepened. Today, the common responsibility for our common destiny is the most important and most necessary foundation of brotherhood and a future for all. All over the Earth, splendid efforts are made to acknowledge this; people prepare peace through great common efforts in the areas of production and culture. “It is a central prerequisite for being a professional teacher to exhibit the will to and develop skills to teach and bring up children. It is a central prerequisite for being a teacher that you mainly, but not only, with background in own experiences, exhibit the will to and develop skills to study and understand theoretical pedagogy. As can be seen from the here mentioned central prerequisites, the teacher trainee examines the theoretical background for pedagogical ideas and for methods of teaching and learning, basically with her own practice as point of reference, which is essential for the learning process that must take place. Conclusion from the "White Book"
“In form as well as in content, the proposition states the basic preconditions that we find are fundamental for practicing our profession as teachers. The proposition takes an active part in the problems of its time, and places the future teachers in a more favorable position, in that they do not automatically act as keepers of a tradition that has proved inappropriate a long time ago, but on the contrary, through experimental practice, have been trained in confronting thoughts and notions – all sprouted from tradition – with the grind of reality, which is the only one that can test the validity of these thoughts, the only one that can judge about their value for tradition. The Necessary Teacher Training College at Tvind applied for, and received, recognition and funding from the Danish Ministry of Education as an experimental training for its first two teams, which were carried through in succession. After that, DNS received permanent recognition for the enrolment of up to 50 students per year. This arrangement continued until 1989, when state funding for DNS ended as a part of wider budget cuts for teacher training colleges. After that, DNS continued its training without state funding. The programme was changed in various ways to accommodate the need for the students to earn school fees throughout the training. From this time, the student body at DNS changed from being comprised almost solely of Danish students to being young adults from all over Europe. The teachers from the first DNS teams who were employed in Danish public schools were no ordinary teachers. They wanted their students to learn about and get to know people from all around the world. They wanted them to understand and take a stand to the inequalities between North and South, and to big, important issues in general. They themselves wanted to act to improve the living conditions for all people, and they did not doubt that the children and young also wanted to be involved. In 1977, the first Development Aid from People to People (DAPP) organisation was formed in Denmark by teachers and students from the DNS Teacher Training College and from The Traveling Folk High School. Together with school children in towns across Denmark, they formed the DAPP Scout Movement. DAPP scouts went door to door collecting second-hand clothes, furniture and bric-a-brac, selling them at flea markets and in small shops together with other volunteers. They built water pumps and produced hoes, repaired jeeps and transformed them into ambulances, produced soy protein biscuits and notebooks, getting all the materials for free. Containers with equipment and materials were sent to refugee camps in Mozambique for those who had fled the struggle against the Apartheid regime in Rhodesia. In school, the Danish children learned from their DNS-trained teachers about colonialism and neo-colonialism. They learned about life under Apartheid in South Africa, Rhodesia and Namibia and about the liberation movements fighting to get rid of this cruel system, and the children in turn explained the issue of Apartheid to people all over Denmark. When Zimbabwe celebrated its independence in 1980, DAPP children’s delegation teams travelled to Zimbabwe, where they participated, together with Solidarity Workers from The Traveling Folk High Schools, in building the Chindunduma school for children, many of them orphans, returning to their liberated country from the refugee camps in Mozambique. From its start and onwards, Development Aid from People to People built up a strong relationship with countries in Southern Africa. National associations were formed in Zimbabwe, Mozambique, Angola, Zambia and Guinea Bissau. Later, the International Humana People to People Movement was formed, which today encompasses 32 national DAPP and Humana organisation working in 43 countries around the world. The Humana People to People projects in Southern Africa developed and multiplied, with income from Humana People to People second hand clothes sales in Europe, USA and Africa and funds from international and national organisations through the system of Partnership in Development. Throughout the years, Humana People to People developed several project types as part of answering the huge challenges facing The Poor in the countries where they worked. Vocational Schools, Street Children Schools and Children’s Towns were among them, as well as Child Aid projects. Frontline Institute was started on the background of interviews with the Presidents of the Frontline States in 1985, first in Denmark, later in Zimbabwe. The two largest countries in which DAPP worked in those years were Mozambique and Angola. The civil war from 1980 to 1992 in Mozambique, and Angola’s 30-year civil war which was finally ended in 2002, left behind shattered education systems in both countries, with an urgent lack of schools and teachers, especially in the rural areas. 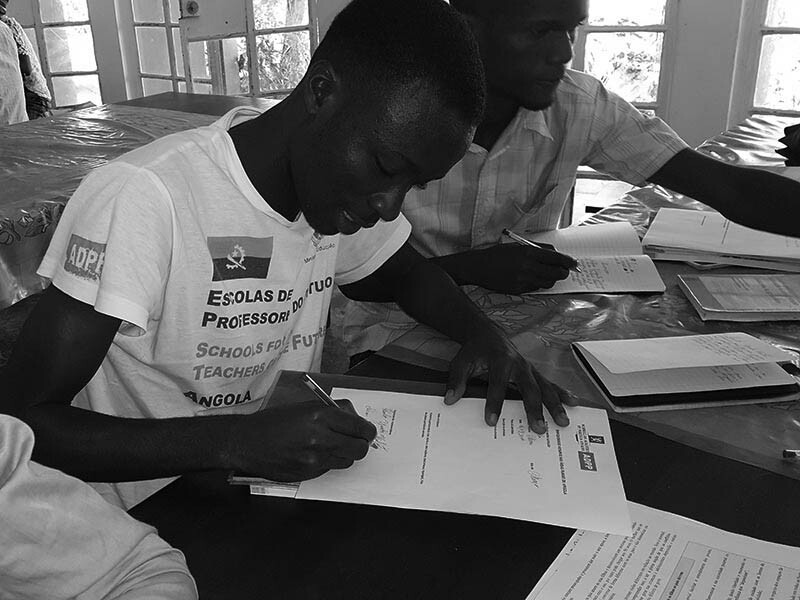 Soon after the peace agreement was signed in Mozambique in 1992, ADPP Mozambique took contact with the Ministry of Education with the aim of starting the first teacher training college, in Portuguese “Escola de Professores do Futuro” abbreviated to EPF. This was a peace present for the people of Mozambique. It was a teacher training programme specially designed for training teachers for the rural primary schools, teachers with the ambition and the ability to create development, not only in the schools, but also in the communities. Thus, the first DNS school in Africa started in Maputo in Mozambique in 1993, and in 1995, two more colleges started: EPF Nhamatanda in Sofala in Mozambique and EPF Huambo in Angola. In 1996, ADPP Mozambique signed an agreement with the Ministry of Education about establishment and operation of 12 teacher training colleges in Mozambique, one in each province. In the same year, ADPP Angola signed an agreement with the Ministry of Education in Angola about 16 colleges, again one in each province. The signing of these agreements indicated the seriousness of Humana People to People in the two countries, as well as the seriousness of the two involved governments concerning training of teachers for the rural primary schools. In 1998, the DNS Movement in Africa comprised 9 teacher training colleges, 5 in Mozambique and 4 in Angola. At this point, it had become clear that in order for DNS Africa to continue to expand, it was necessary to train college teachers for that specific purpose who were well versed in the concept of the teacher training colleges and ready and willing to take part in the continuous expansion of DNS Africa. One World University, or OWU for short, was therefore started by ADPP Mozambique. In the following years, the university operated in close cooperation with the Pedagogical University of Mozambique while going through a process of recognition. In 2005, OWU was approved by the Council of Ministers in Mozambique as a private university. It was accredited to deliver academic courses and degrees from the level of bachelor to PhD with a nationally recognised qualification, and was given its official name ISET – Instituto Superior de Educação e Tecnologia, in short ISET/OWU. Today, One World University has three faculties: the Pedagogical faculty, the faculty of Fighting with The Poor and the faculty of Polyhistory. The university offers courses, either on site at its campus in Changalane or through distance learning. From 1999 and onwards, the DNS movement expanded steadily. In 2003, the first DAPP teacher training college in Malawi took in its first team of students, who, like the first Danish DNS team and many pioneering DNS teams in Mozambique and Angola, took part in the construction of their own school buildings through construction camps and building weekends. A continuous qualitative development also took place, not least through extensive and systematic collaboration between the colleges. One such development was the introduction of the DMM method of learning, a digitally based system which places the students in the driving seat of their own training. Another development was the definition of eight Centre Activities for each college to include in its sphere of activities. The idea was to utilise the DNS facilities fully and to make each teacher training college a centre for education, reaching out to primary schools in the district and the province, taking care of further education of teachers, including day and evening courses for teachers and others, operating pedagogical workshops, and training preschool teachers for community preschools. Today, the DNS teacher training colleges function as active and lively centres in their communities. At all times, all kinds of activities are going on, run by students and teachers together, and thus providing an important training ground for the would-be teachers for their later role as community developers as well as teachers. At this time of writing, February 2018, DNS in Africa comprises 33 teacher training colleges in all, 11 in Mozambique, 15 in Angola 4 in Malawi, one in Zambia, one in Congo and one i Guinea Bissau. The DNS Africa colleges graduate around 2,500 teachers for rural primary schools every year. The DNS Movement has expanded to the Indian subcontinent. In 2009, Humana People to People India entered cooperation with the state of Chhattisgarh with the aim of training primary school teachers using a DNS teacher training programme tailor made for India. Today, Humana People to People works with the State governments in Haryana, Madhya Pradesh, Bihar and Uttar Pradesh to implement the NeTT (Necessary Teacher Training) programme in 19 institutions. DNS Tvind has entered into an agreement of cooperation with One World University in Mozambique, allowing its participants to earn a licentiate of Pedagogy degree from OWU as distance learners while following the teacher training programme at DNS Tvind. The licentiate degree from OWU corresponds to a Bachelor’s degree in Pedagogy. DNS Tvind welcomes all to join the thousands of young adults who through the years have been trained as qualified, skilled and passionate teachers at the DNS teacher training programs all over the world. The NECESSARY Teacher Training College was started from a NECESSITY to train another kind of teachers to bring more relevant knowledge, mobilisation and life to children and schools. 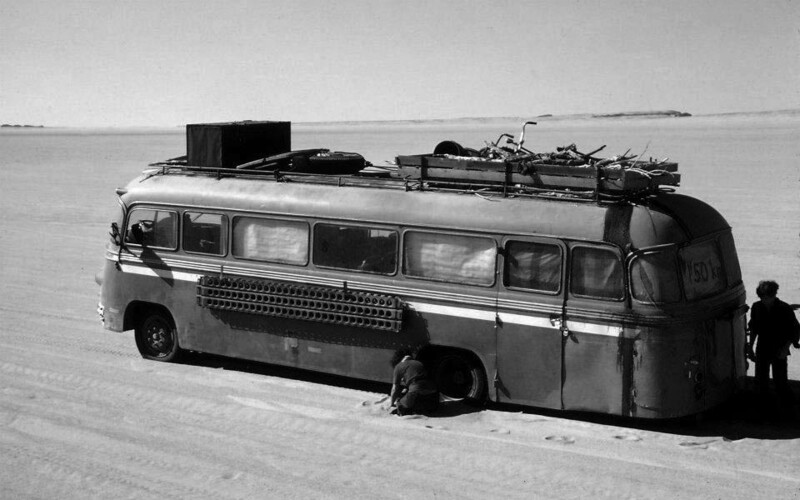 Travelling in own buses has always been an important element in the DNS education. The first DNS in Angola was opened in Huambo in 1997.